Winter Finches — And More? 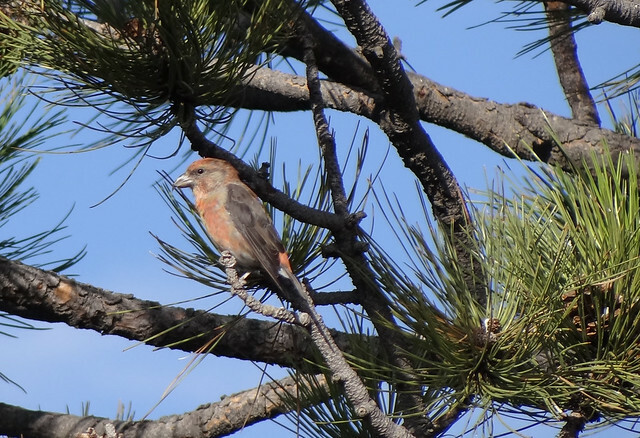 The good numbers of red crossbills and pine siskins in Nebraska’s Wildcat Hills this past week bode well for a winter of montane visitors to the western Great Plains. 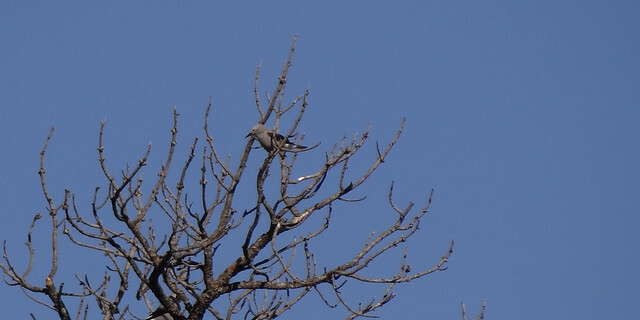 The less than annual presence of Clark’s nutcrackers on the Pine Ridge — we saw more of the species in Nebraska than in South Dakota! — bodes even better. And the three Cassin’s finches at the Wildcat Hills feeders this morning, up from one yesterday, suggest that something truly is happening to our west. Nebraska birders can probably look forward to Steller’s jays, mountain chickadees, and at least two species of rosy finch this winter. 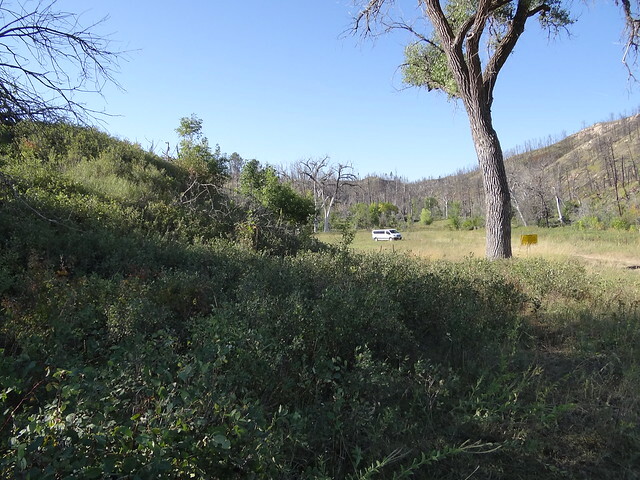 Hopeful souls will be on the lookout for new state records of the Woodhouse’s jay, bushtit, canyon towhee…. Hard to believe and sad, today was our last full day of birding together in Nebraska. It started a bit slow in Carter Canyon, but picked up as we walked down the road. Cedar waxwings and Townsend’s solitaires occupied the tree tops, and red-breasted and pygmy nuthatches fed busily in the pines. The morning belonged to the red crossbills, though, small flocks almost continuously in the air; our tally in a bit less than two hours easily exceeded a hundred birds. Unfortunately, what would probably have been the bird of the day — of the trip, of the year — was the one that got away. I’ve never seen a Baird’s sparrow in Nebraska, but I have a strong and frustrating suspicion that that is precisely what we chased through the grass for a tantalizing half hour. We soothed our disappointment with a roadside flock that contained clay-colored, white-crowned, and Lincoln’s sparrows along with a brace of blue grosbeaks and two or three lesser goldfinches. All but the Lincoln’s sparrow were birds we’d seen several (or many) times this week, but for some of us, this might have been our last looks for some months at these common western birds. 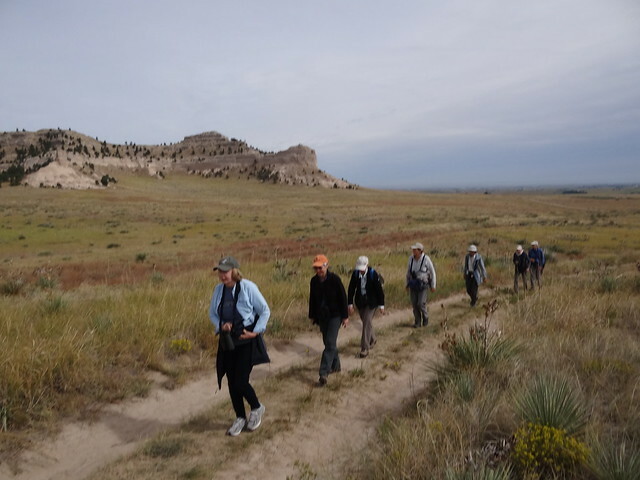 After lunch we ascended Scotts Bluff in search of swifts. The wind up there was terrific, gusting to more than 50 miles an hour, and the local avifauna made itself sensibly scarce. We saw a couple of acrobatic red-tailed hawks, a rock pigeon or two, and a few spotted towhees doing their best to keep from getting blown off the bluff top. We crept back to the car, heads bowed and brows furrowed, and drove back down to town. Missing the white-throated swift this time of year is a not infrequent disappointment, but it was eased when we got out of the vehicle at the Emporium (highly recommended) to see two chimney swifts low overhead. Not the apodid we’d been hoping for, but an addition all the same to what has become a very nice trip list indeed. 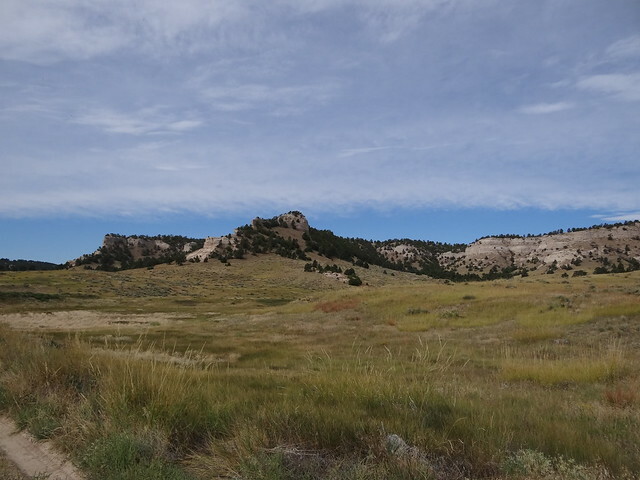 East Ash Canyon is one of the most reliably birdy spots on the Nebraska Pine Ridge. 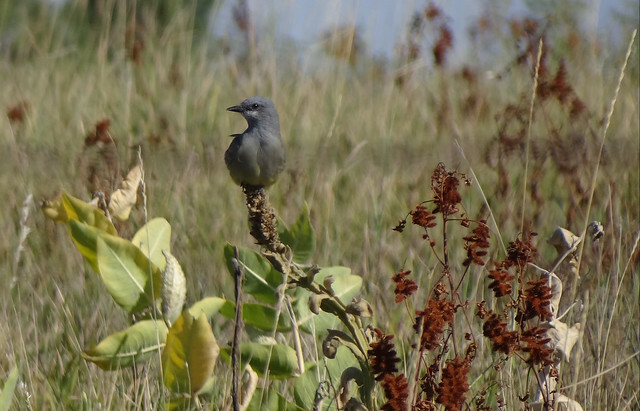 Over the years, I’ve seen some very “good” birds there, including my only gray flycatcher ever for the state. Today’s haul may have been even better. We started at dawn in Chadron, driving south in an attempt to beat the traffic on Table Road. We had one target species, and I’d almost given up on it when a flash of white in the ditch caught my eye. I think I was the only one in the vehicle to get a decent look at this sharp-tailed grouse before it flushed — but it landed not far away on the wheat stubble, and we all got excellent scope views of the sweet-faced bird. It quickly became apparent that “this” grouse was in fact “these” grouse, and we tallied eleven before the approach of a stock truck inspired us to move on. The grouse was a life bird for most of the group, but it got better. At the switchback on East Ash Road, a different flash of white from the top of a burnt pine puzzled us for the moment it took me to stop the car, quickly resolving itself into a Clark’s nutcracker. I’d been dreaming for decades of seeing that species in Nebraska, and my first soon became a second, then a third, until we had a dozen or so nutcrackers milling around the steep canyon walls, where they were mercilessly and inexplicably harried by American robins. We found another gang of four birds a couple of hours later at the bottom of the canyon, and a single individual bade us farewell as we left late in the morning. Things are afoot, as the large numbers of red crossbills and pine siskins also suggested. It could be a very interesting winter out here on the western plains. East Ash was full of red-headed woodpeckers and northern flickers of all colors, too. Noisy Nelson’s white-breasted nuthatches gave us the best views yet, and were joined by smaller numbers of red-breasted and pygmy nuthatches in the pines. An eastern phoebe haunted the creek while a Townsend’s solitaire fluttered in the brush and spotted towhees mewled and whined from every thicket and brush pile. While most of the bluebirds on our way in had been ethereally blue mountain bluebirds, down in the canyon they were all easterns, flocking with the robins and siskins. Flush with success, we drove over to West Ash to see if there were nutcrackers there, too. It was very quiet, a surprising contrast to the scene just five miles downstream, so we took a short walk in the delightful cool of the late morning and set out for the highway. Our progress was halting, as it always is for birders. A fine Cassin’s kingbird posed for its portrait; as expected, this has been the only common kingbird — indeed, nearly the only kingbird at all — on the trip, with most western kingbirds well on their way south already. 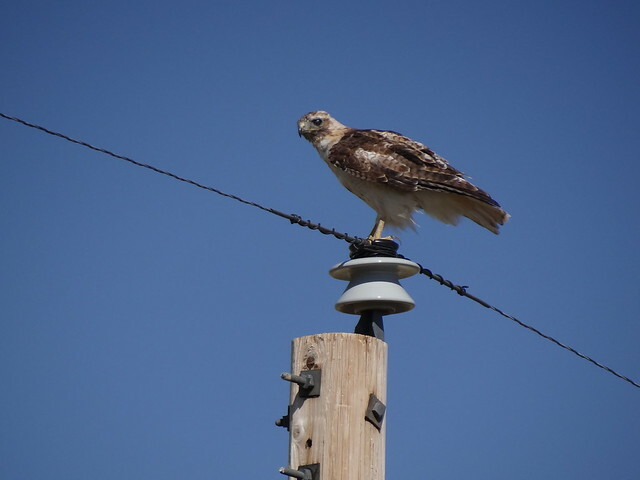 As we approached the highway, two big raptors overhead revealed themselves to be neither turkey vultures nor red-tailed hawks, both species that were increasingly common as the day warmed. These two, though, were different: an adult and a juvenile golden eagle, soaring close to each other and wheeling repeatedly to give us unexcelled views. We’d seen an adult in Sowbelly Canyon a few days ago, but the sight of these birds, low against the bright blue skies of autumn, the adult’s golden nape flashing nearly as bright as the juvenile’s wing and tail patches, is likely to be one of the finest and most enduring memories of the entire trip. After lunch in Hay Springs (our second mid-day meal at the Bar J, home of the best steaks in the panhandle), we moved south along the very western edge of the Sandhills. Hardly had we left town when two big bobcat kittens appeared on the roadside. There’s a certain injustice in the way mammals immediately push thoughts of even the rarest and most dashing birds from our minds. The big lakes had a good selection of ducks, including the first redheads of the week, but shorebirding was a disappointment: killdeer, stilt sandpipers, lesser yellowlegs, and Baird’s sandpipers were all present in just small numbers. The only common wader was the American avocet, with 172 on one lake; a juvenile peregrine falcon, a scarcish bird out this way, kept them wary. That same lake gave us our first white-faced ibis and Franklin’s gulls, both birds I’d expected to see much earlier and neither the less welcome for the tardiness of its appearance. Tomorrow: the Wildcat Hills. I can’t wait. 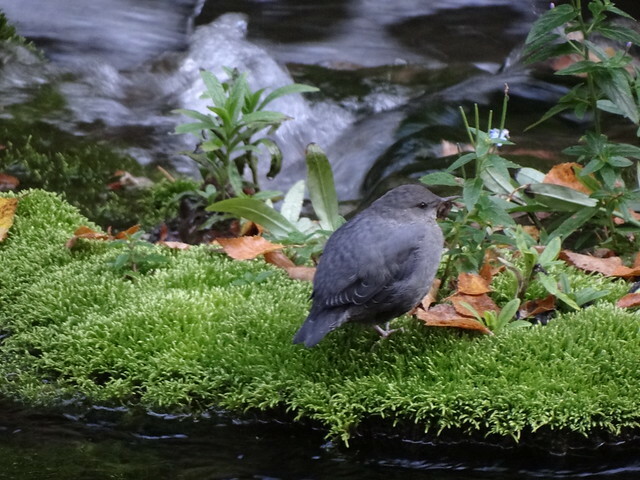 American dippers have a decided eye for the most beautiful real estate around. 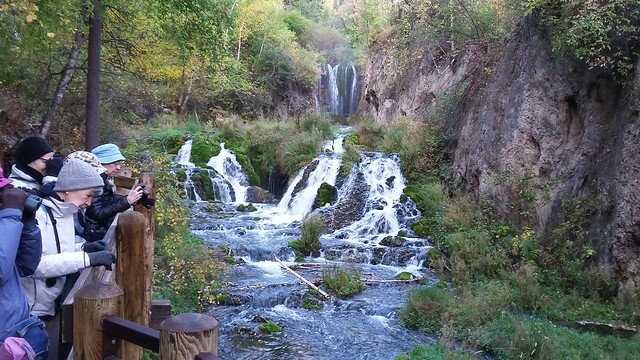 Roughlock Falls, high in the northern Black Hills, would be delightful even without its famous cinclids — the combination of the two is downright enchanting. We watched this immature snooze and preen and stretch in the freezing air, then suddenly start feeding frenetically atop mossy rocks and in shallow water. I’d been hoping for a quick flyby or maybe two, but this one stayed with us for half an hour, winking and blinking as it bobbed and splashed. 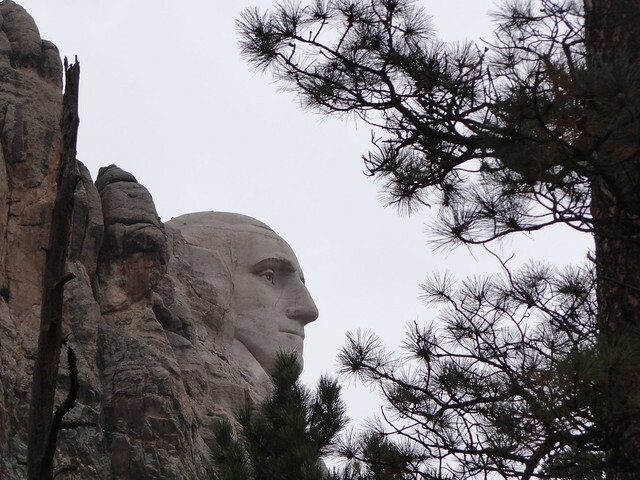 Still grateful for our good luck, we moved on to cast a glance at the stone faces of Mount Rushmore, then to a quick lunch in Hot Springs before moving south to Four-Mile Draw in Custer State Park. It was almost birdless there (how quickly red-shafted flickers and mountain bluebirds have become routine! ), a circumstance due at least as much to the cloudy skies as to the merlin, American kestrel, and unidentified big falcon we saw flashing around. Instead of rare woodpeckers, Custer delivered a good mammal show. American bison kept me on high alert, black-tailed prairie-dogs kept all of us in stitches. 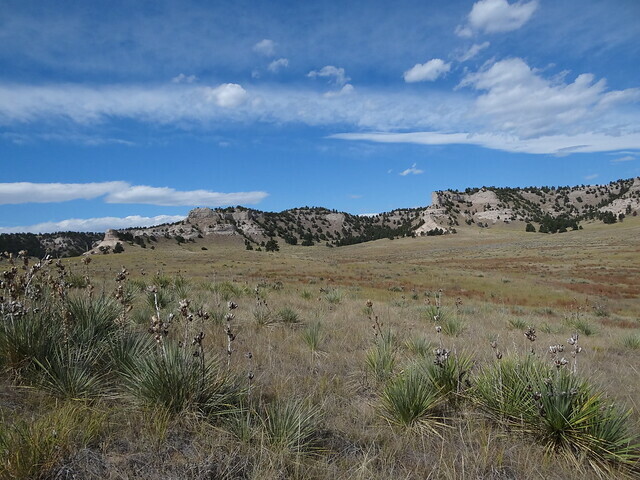 White-tailed and mule deer and pronghorns were loafing on the roadsides, and two coyotes gave us two kinds of equally evocative views — one in full and glorious lope through a dog town, the other little more than a set of sensitive ears moving through the grass. 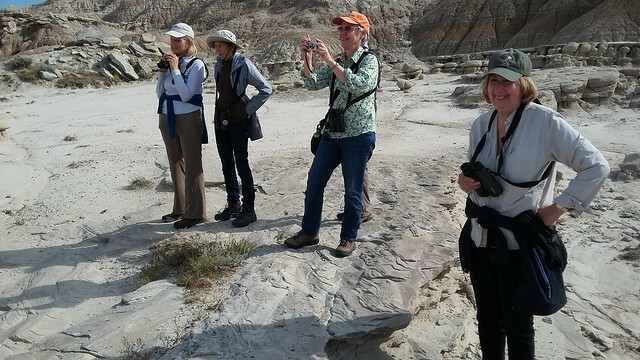 Thanks to the lack of birds at Custer, we had a little extra time to stop in at the badlands of Toadstool Park on the way to Chadron. I had predicted two species, but an errant turkey vulture made three. 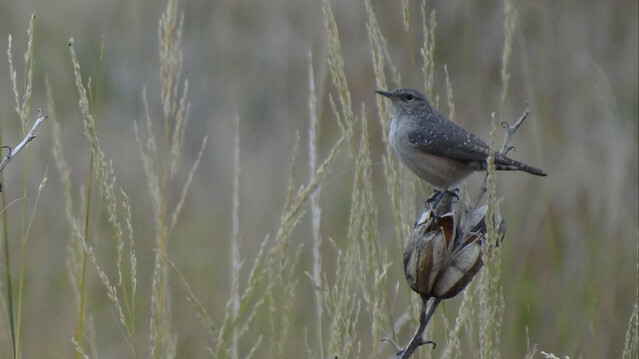 A Say’s phoebe hunted from the mushroomy erosional remnants, and at least three rock wrens bounced around on the rocks and into and out again of impossibly tiny crevices; one was quite an expert flycatcher, leaping several feet into the air to take insects. 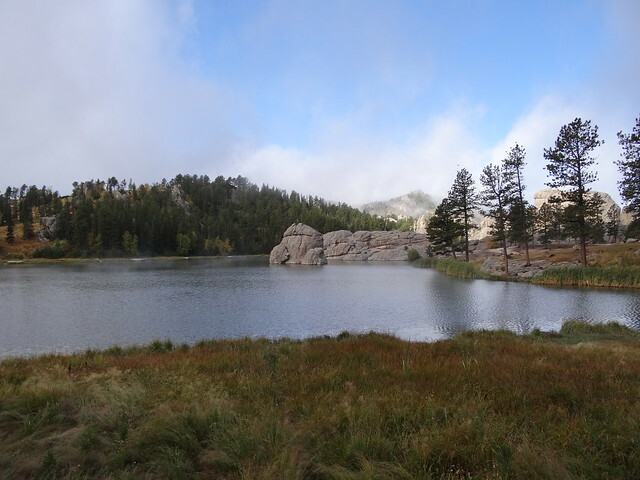 The skies clouded as we reached Chadron, and there was a brief but heavy shower while we had our early dinner. Undeterred, most of us set out afterwards in the sunset for Chadron State Park. It didn’t take long to find common poorwills, four of which granted the kind of views we’d been hoping for earlier this week. The species was a lifer for several in our group, and even those of us more familiar with this cute nightjar relished the great looks we had at birds sitting on the road and hunting in our headlights. Great ending to a great day! We arose this morning to temperatures a full 55 degrees lower than those we’d basked in in Denver. And fog. And mist, and a little rain, too. 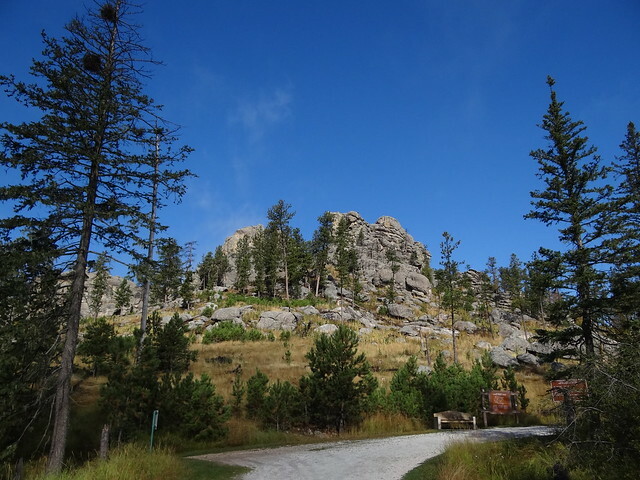 All that changed, suddenly, miraculously, within moments of our arriving at our first stop for the day, Sylvan Lake, more than 6000 feet up in the Black Hills. First the clouds lightened, then lifted, and soon enough the sky was actually blue — a rare enough sight at this location, and one that we enjoyed to its fullest. 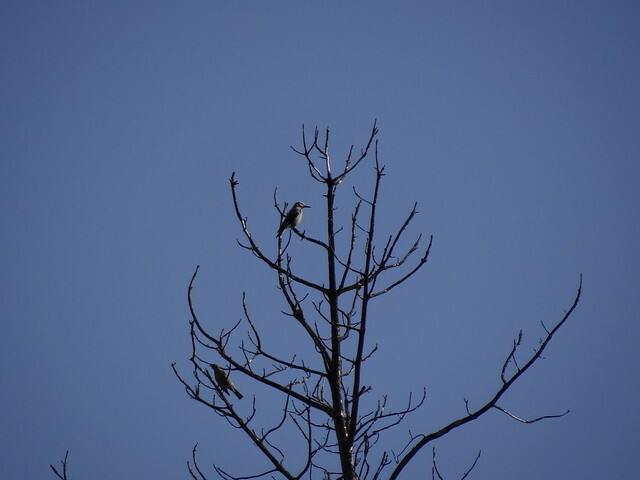 We saw several good birds up there, including an adult broad-winged hawk, two squabbling sharp-shinned hawks, a Clark’s nutcracker, and a gray jay. As usual, though, it wasn’t the rarities and scarcities that truly made the morning, but rather one of the commonest birds of the area, and perhaps its most charming: the white-winged junco. I love seeing this species (!) at this locality because it calls to mind the story of Elliott Coues, Principal Danby of Custer High, and their new junco from Sylvan Lake. 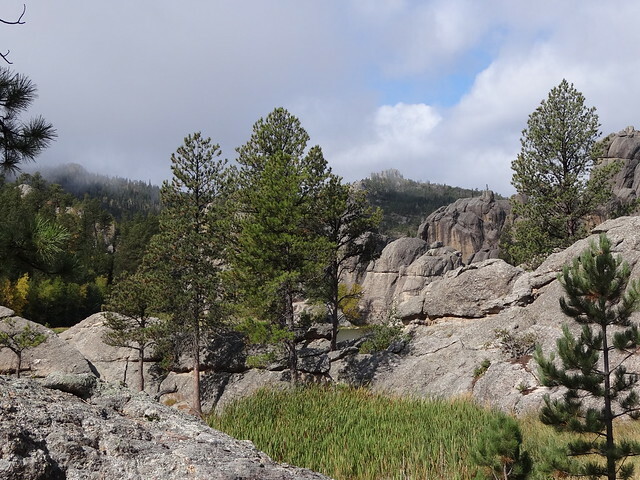 Coues had been stationed at Fort Randall in the early 1870s, but he paid his first visit to the Black Hills in 1895. On September 16 of that year he wrote from “picturesque and romantic” Sylvan Lake, where he had installed himself for a month of “much-needed respite from work and worry.” Coues may have escaped worry, but his work was with him always, especially in a place as birdy as Sylvan Lake. 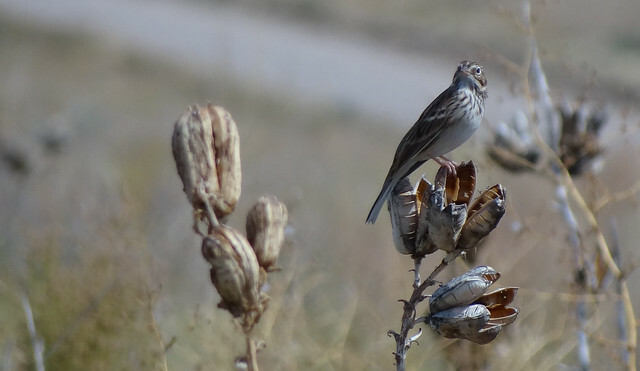 Two birds in particular caught Coues’s attention: the pinyon jay, “one of the commonest birds,” and the breeding junco, which the visiting ornithologist tentatively described as a new taxon to be named Danby’s junco, Junco hyemalis danbyi. The proposed subspecific epithet was chosen in honor of Durward E. Danby, principal of the high school in Custer, the faculty and students of which Coues happens to have addressed earlier in the day on that September 16. 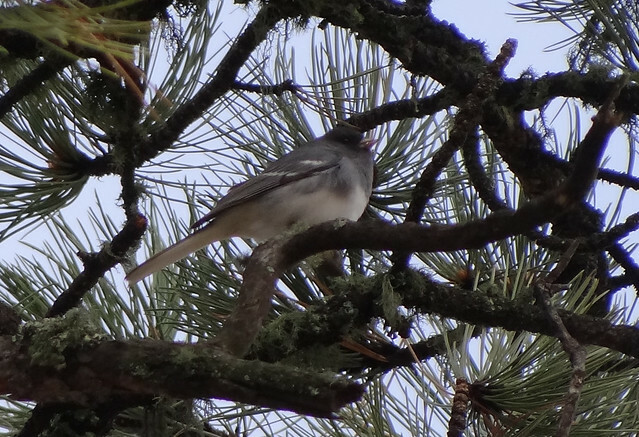 The impression is that of a large gray rather than blackish bird, with the dark color ofthe breast fading gradually into the white of the belly [and] the gray of the back overcast with a brownish wash; and some of them show an approach to the characters of aikeni [the white-winged junco] in having an imperfect wingbar formed by the white tips of the … secondary coverts. even in individuals that lack the eponymous wing bars. The bird could not be mistaken for hyemalis at any age; the ‘aspect’ in life, even at gunshot range, is distinctive; for one receives the impression of a large gray bird. We confirmed that impression over and over this morning as we watched our white-wingeds, the descendants or at least near relatives of the very birds described from Sylvan Lake exactly 122 years ago today.